Danforth and Woodbine looking west. No, it’s not an experimental train of air-electric multiple unit cars, and these are certainly not Bloor streetcars given that the subway had been open for over a year when this was taken. Note the old yellow and blue “Night” stop. This corner and the vista to the west make an interesting comparison to the present day view on Google Street View. Even today, the buildings are low rise all the way west, an excellent example of how a subway does not necessarily trigger or require high rise development. The Royal Bank is still on the northwest corner, but Scotiabank has moved across the street to a new building where National Trust and Kresge’s used to be. Everything else has changed hands, although the buildings are mostly the same. Bowling alleys were common in the 60s, but they gradually disappeared. Billiard halls were not the sort of place respectable teens could hang out. 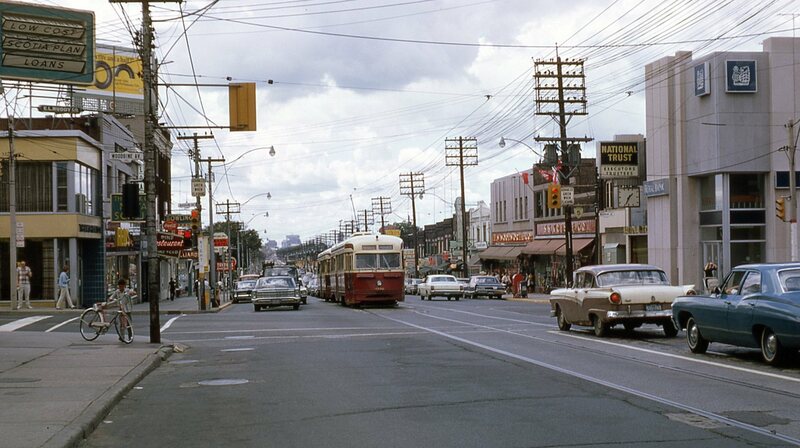 Bloor and Bathurst looking east. The brand new subway will open in about one week, and the Bloor streetcar is about to vanish into history. Much else in this photo would disappear as well. The buildings are still there, but their use has completely changed. The TD bank is now a coffee shop, Danforth Radio is no more, and the Midtown cinema is now the Bloor. Street signs have changed a lot since the 60s. Toronto outlawed the overhanging signs decades ago, and the few that remain are grandfathered. Traffic regulations are spelled out rather than shown as graphics. A demure “TTC Subway” sign with a small arrow directs passengers who might be looking for the Bloor car to the subway station just up Bathurst Street. 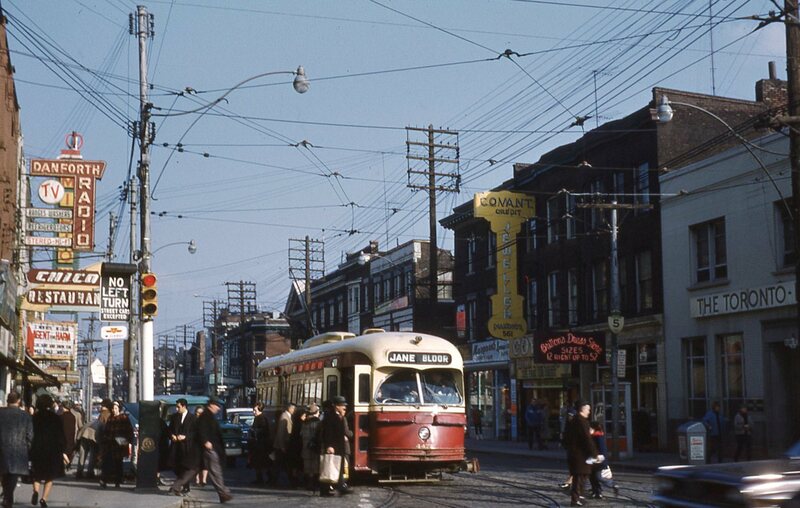 The hydro wiring is still in overhead box structures, and the classic Toronto acorn luminaires had yet to be replaced by sodium vapour lighting on higher poles. There’s a phone booth on the sidewalk and a pre-Astral garbage bin. As usual during the holiday period, service will operate at a reduced level because schools are closed and many people are on vacation. The late night closing time for the Yonge subway north of Eglinton varies from day to day because of holiday schedules for the crews working there on tunnel repairs. The hours of service through the holidays are summarized below. Ridership projections for the TTC continue to climb with the year-end total now projected at 499-million, up 2-million from an estimate only one month ago. The TTC’s “surplus” (actually a decrease in the projected subsidy level from the original budget) is also growing thanks to higher fare revenue and cuts in projected spending for the remainder of 2011. The details are included in the Chief General Manager’s report covering the system’s operation up to the end of October 2011, but with year-end projections based on more recent experience. With discussions of the TTC’s 2012 budget still swirling at City Hall, the update to projected 2011 figures raises questions about just how much money the TTC actually needs to balance its books and how much service will actually be required in the new year. Comparing 2011 projections as they appear in the current report and in the November 23 version, we can see where the year-end estimates have changed. Revenue from fares is projected at $3.4m more than in the November estimate. Although there will be 2m more rides, some of the increase reflects travel by passholders that contributes no marginal revenue. 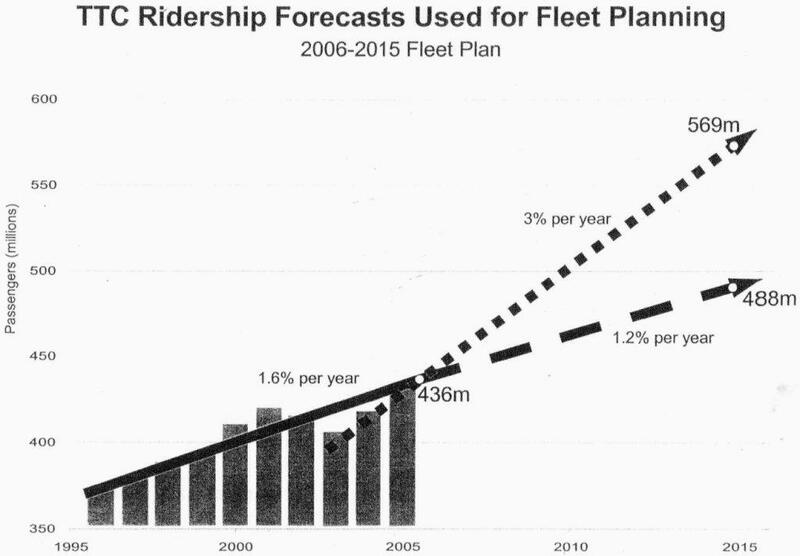 Overall ridership is running at 4.9% over 2010, almost 2% higher than the commonly used 3% rate in many projections. On the expense side of the ledger, some projected costs have fallen. The saving from “gapping” (leaving vacant positions open longer than planned in the budget) is up by $0.7m, and other reductions will save $1.8m. The one-time cost of Corporate Restructuring (downsizing ) is now estimated at $3.0m less than expected. This gives a total reduction in expenses of $5.5m compared to the November estimate. Looking at any financial statements, it is important to distinguish between one-time costs and the ongoing expenses of an organization. Because only the variations to budget are reported, we can only see the budget lines where these occur, but it’s worth noting that if the net effect of one-time items is eliminated, the surplus would be about $7m higher. Some of these items are non-cash bookkeeping entries that cancel each other out, but the cost of downsizing TTC staff is a real cost that applies only to 2011. The proposed 2012 budget includes a 10-cent fare increase to adult tokens and to senior/student tickets with roughly proportional changes to other types of fare (see page 11 of the linked report). TTC staff have been asked by the City’s Budget Committee to report on an option for a 15-cent fare increase that would generate enough additional revenue to reverse the proposed January 2012 service cuts. This analysis will likely appear before the TTC Commission meets on December 14, and I will update this post when the report is available. Based on recent strength in ridership, the TTC now projects that 2012 riding may reach 507-million rather than the originally estimated 503m. This pushes the revenue estimate for 2012 by $5m. However, if the actual 2012 results come in at 499m, even at 507m the 2012 ridership would only be up by 1.6% showing the combined effect of demand growth and riding lost to the fare increase and service cuts. If service is retained at the current loading standards and if the fare increase has no effect on riding (as happened when the TTC raised fares by 25-cents in 2010), then ridership could grow by 3% or more taking us to at least 514m in 2012. This has major implications for service planning next year and beyond. TTC staff project that at the 507m level, $1-2m worth of additional service will be required in September 2012. Multi-year projections in the budget report are already falling behind likely ridership levels. Without a fare increase (or equivalently with no drop-off in demand caused by higher fares), the TTC projects 2013 ridership at 515m or only 3.2% above the projected 2011 total. To 2015, the projection is 536m or 7.4% above 2011. If the presumed effect of higher fares is included, the 2015 figure is even lower at 523m. These are very conservative estimates, and all of them include the effect of service standards cuts that may not actually take effect. If ridership were to grow at 3% compounded from 2012 through 2015, the TTC would reach about 562m rides in four years’ time. That’s a lot of additional riding and service, and it would be borne by the existing system as no rapid transit expansion is planned until mid 2015 at the earliest (the Spadina extension). Although the TTC does provide pro-forma budget estimates for 2013-15, these are based on conservative assumptions and do not provide a broader view of the decisions and options facing the transit system in coming years. Whether such a discussion would be welcomed at City Hall is anybody’s guess — more spending on transit is probably the last thing the right wing of Council and the Mayor want to hear about. However, this puts calls for much improved subsidies both from the City and Queen’s Park in the spotlight. Anyone who may call for higher subsidies really needs to understand where transit in Toronto could be headed. If we ask for more money based on too-conservative estimates, we will be right back at a point where funding seems inadequate, never catching up to actual demand. Even worse, if that funding is used primarily to flat-line fares, the crunch on service will tighten and transit will be even more inconvenient relative to driving. Debates about the future of transit cannot be put off indefinitely with the claim that we can’t afford to improve the system (except for the odd multi-billion dollar subway scheme). The pressure for more capacity in our transportation network won’t vanish simply through political rhetoric. TTC budget debates continue to focus on one-year views, on shuffling a few millions here and there on a table where billions are at stake, on scoring political points against competing views of what transit should be. That’s no way to serve the riders, the citizens of Toronto. Can the TTC Survive Budget 2012? What are the implications if Council were to move to roll back the TTC service cuts planned for January 2012? What will the new loading standards, if they are retained, mean for transit riders? Why is the proposed fare increase disproportionately high for seniors and students, and why is at least 20% of the additional revenue going to subsidize Wheel-Trans rather than maintaining the quality of regular service? When will the SRT conversion to LRT actually happen, and when will the line re-open? Confusion at the TTC had everyone thinking a seven-year shutdown was in the works. I plan to add to this post with additional information about the TTC’s budget presentation, but have other things on my plate at the moment including a talk tonight (December 7) at Metro Hall, Room 310, 7 pm for Post Carbon Toronto.